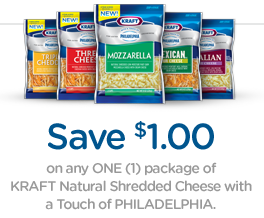 Save $1.00 on any ONE (1) Package of KRAFT Natural Shredded Cheese. Sign up or Log in your account at Real Women of Philadelphia to print coupon. Scroll down the page and you will find the coupon on the right hand side of page.